Attention, this limited edition was completely sold out ! This Santoku Knife features the look and benefits of Damascus steel, yet without its rusting problems. The Damascus-look HAMMERED blade profile reduces sticking and results in less damage to the food being cut and faster prep times. 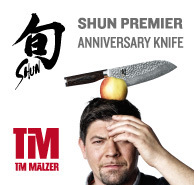 For the trend-setting Shun PREMIER Tim Mälzer series, Kai has developed six additional knives made from corrosion-resistant 32-layer damask steel. It is embellished with a hand-hammered surface which in Japan is known as Tsuchime, thus combining timeless aesthetic qualities with ultimate sharpness. The blades have a massive core of VG-10 steel with a hardness of 61±1 HRC.